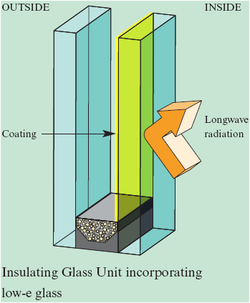 The use of sealed insulating glass units has expanded greatly in recent years. As they may represent a major item in the cost of the building enclosure, and as they have certain potential limitations as well as advantages, an awareness of their physical characteristics is essential. Sealed glazing units are sometimes referred to as "insulating glass," and may be specified because of some assumed thermal advantage over other double glass arrangements. Their principal advantages, aside from simplification of design through the use of a single sash unit, are: reduction of the number of surfaces that require cleaning to two, and the elimination of condensation between the panes. Indeed, the prevention of such condensation is a principal requirement of satisfactory service. They also can provide increased sound insulation. Decorative units - including Georgian, leaded, bevelled designs, coloured overlay designs. High Performance I.G. Units manufactured with soft coated glasses and gas filled to +90%. These units can be double or triple glazed dependant on the level of insulation required. 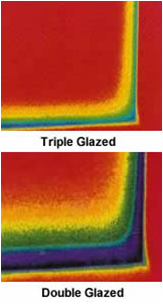 Lower U Values are available with our most efficient triple glazing configuration increasing the insulation value to 0.6w/mk2. Utilising special soft coated glass in your IG unit, you can increase the insulation value of your units to as little as 1.2 W/m2k as standard. Lower U-values are available upon special request. We are very proud to be one of the first independent manufacturers in the UK to achieve the new European Kitemark standard BS EN 1279-2/3 for the manufacture of insulating glass units. Led by a focused management team, we have set our targets to become a leading manufacturer of insulating glass units to the trade industry. Bulk orders supplied without delay! Fast turnaround on all IG orders!